When I first moved to the US, I had about 5 cardboard boxes of stuff to my name. None of those boxes contained any furniture and so a very kind young lady lent me her futon so that I'd have something comfy to sleep on. The futon has stayed with us from one move to the next, but it's time has come. It's last incarnation was as part of the kids bed (we merged the futon base with the main body of a kids single bed) but we recently bought a loft bed for them to share and the futon was suddenly in the way. The mattress is currently a sofa/bed in the kids room which left this lovely source of untreated pine just staring at me wanting to be used. Rather than put it on craigslist, I gave in to my urges and decided to transform it into something we needed (and would keep for a long time to come). 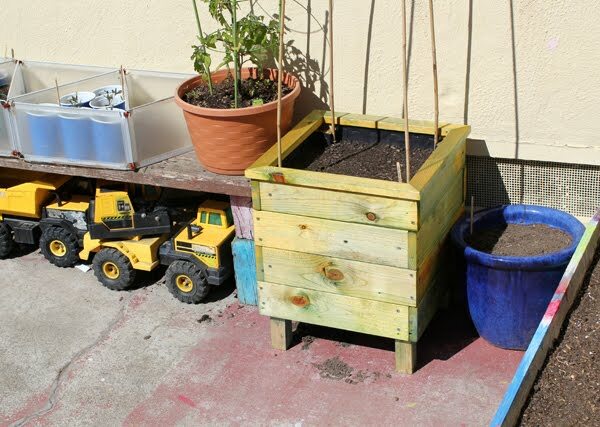 We've been experimenting with growing fruit and veg in our back yard since last year so it seemed like a good use of the wood to make some planter boxes. The base was kept together with bolts and screws - no glue! which made for a fun half hour with screwdrivers for me and the kids. I figured we could make a couple of planters from all this wood. Lin had the bright idea of using some metal mesh we had left over (from some stacking wire storage cubes ) as the base of the planters and it just so happens that the 2"x2" poles fit snugly in the corners after a bit of metal snipping. After measuring the wood and the wire mesh, it turns out that I could make two planters around 17" tall. I cut up the 2"x4" planks into smaller pieces each 14 1/4" in length and cut 4 legs from the 2"x2" - each measuring 17". I routed out a 1/4" wide by 1/4" deep dado around 1/2" from the bottom on 4 of the small planks so that the wire mesh fitted snugly. I routed out a similar channel on two adjacent sides of the legs (higher up though, so that the legs stick out the bottom) and then secured the planks to each other and to the legs with wood screws. Then it was just a matter of attaching the rest of planks. I went for an alternating spiral like pattern. To finish off I added a lip by cutting and mitering (45 degrees) some siding from the futon and gluing it on (with yellow wood glue). The wood already had a groove in the middle which slotted nicely in place on top of the planters. Then the kids personalised them with some watered down food colouring. I put on a couple of coats of polyurethane to protect them from the elements (i.e. the kids). Lastly, Lin used some black plastic sheeting to line the inside and attached some cheap acrylic felt to the wire mesh to allow drainage. 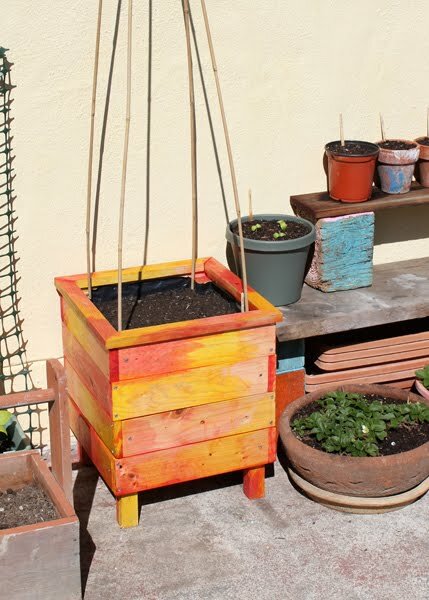 The green planter already has some sugar snap peas sprouting out and the red one has some pole beans. Can't wait to start munching on them! Om nom nom! There's still quite a bit of wood left over (all the thicker pieces and the two widest planks). 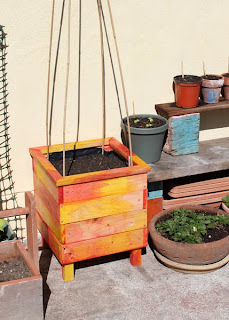 I think I'll make those into another type of planter when I get the chance (similar to the one in the bottom left of the above picture). I must get to posting a few more 'tronics' things... The CNC machine has been up and running for months (and is an endless source/sink for tinkering/tweaking) and I have a load of things to post about it. But I think some charlieplexed LEDs should come first since I mentioned them so long ago, built a few prototypes and then went silent. In my defense, building the CNC machine took a lot of time and effort and we're expecting baby#3 any day now. There always seems to be lots going on :) Oh, I found an old Atlas Cabinetmakers saw at a garage sale down the road as well! I think it was built around 1959 & I've got that up and running too. Now that I've gotten over my fear of table saws it'll be good to use it for something creative. Really cool boxes! I have to say I have never thought about putting together my own planters but the way you assemble these boxes makes it look easy. Of course I'm still using my futon frame so I think I'll just go out and buy wood to make my boxes rather then moving my futon onto the floor. I made some more planters a few weeks back. These were super simple though, just four corner posts with a couple of planks of wood screwed on each face - no mesh. They were going on top of dirt rather than on concrete so no need to keep the floor clean.